There are many versions of banarasi kachori as well as the subzi, I am writing some of them here, the ones I like and keep making often. The one thing I keep in mind while making any such fried dish is that it should absorb less amount of oil and if a kachori is high on oil, the subzi should be very light but spicy to minimise the oil/ghee content of the whole meal. Even the kachoriwalas of banaras seem to follow this at least about the subzi, they make it so light and always put some black gram, paneer or palak (spinach) etc to make it as healthy as it can be. Boil the jeera and ajwain in 1 cup of water and the salt to make strong infusion of the masala. Rub in 1 tbsp of ghee into the atta as shortening, this makes the kachoris more crisp and soft, but I like it without the shortening, it is a bit hard and crisp kachori then. Now add the infusion into the atta and knead a hard but pliable dough, make small balls out of it, roll like puris and fry in hot oil or ghee. Serve hot with the subzi. Heat the oil in a pan and put in the hing and rai and let it splutter. Meanwhile add 2 tbsp water to the powder masalas and make a paste, adding in the ginger paste too. Add this paste in the pan n stir for a while, till oil comes on top, now break the potatoes with hands and put in the pan, smash them with the back of the ladle and mix thoroughly while stirring everything. 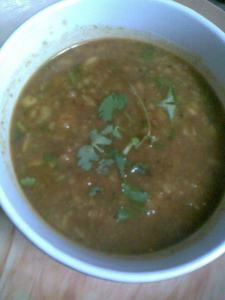 Add salt and around 1 cup of water or more if thin gravy is required, give it a boil and the subzi is ready to serve. 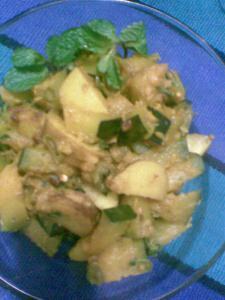 The subzi may be garnished with chopped coriander leaves. Generally kachori is a stuffed puri and the stuffing may be a spicy masala mix of mung dal or urad dal, but in banaras the morning breakfast available in street stalls consists of this flavoured masala puri, which they call kachori. The masala, flavours and even the dal is often mixed with the dough itself to make puris, so here even the dal wali kachori is not a stuffed puri. Rub in the ghee into atta n suji mixture, add all the other ingredients and knead a soft dough, adding more water if necessary. Divide into marble sized balls, roll out puris and deep fry in hot oil. 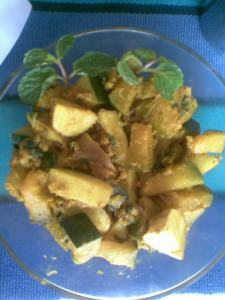 This is a very light but flavorful subzi and can be made in various ways depending on whether the kaddu is raw or mature, which may be light yellow to deep orange in color, if the kaddu is deep orange in color it gives a sweet taste to the subzi and can be made sweet n sour by adding a little more amchoor powder. Here the subzi is made using the light yellow coloured baby pumpkin. Heat oil in a pan and put in all the masalas and let them splutter. Then quickly add in the vegetables and stir for a while. Add salt, red chilly powder and water and cook covered on a medium heat till done. In the last add the amchoor and mash the subzi a little. Optionally 2 tbsp of finely chopped mint leaves can be added to make it more aromatic, or a bit of chopped coriander leaves. Here I have used mint leave during cooking and for garnish too, it makes the sabzi more aromatic and prevents flatulence also, considering it will be consumed with puris. The subzi can be enjoyed without these herbs too. This alu kumde ki subzi makes a very light combination with crispy fried kachoris.. 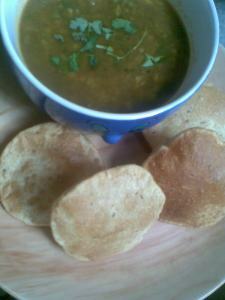 I lived in Banaras years back,but this was our Sunday breakfast.Thanks for postin the recipe. I lived in banaras years back. this was our sunday breakfast.thanks for posting the recipe. Thanks Pravina.....even i was in Banaras years ago . But i get to visit there once in a while. I am looking for the banarsi kemami seviya recipe, the lady made this dish on masterchef india, but I can't get the recipe anywhere. Hi Zarina... unfortunately i did not watch the TV show but i'll try and post the recipe. the aloo sabji was delicious... hit the right spots on the taste buds.. yummmm!!!! thanks! This ras wala aloo is our family favorite too. Please can anyone give me the recipe of Banarasi malayiu, a milk delight, and malai geelauri, a paan-shaped sweet? The real Banarasi Kachori could be eaten in the "Jaljog" restaurant in Godaulia chworaha in the 1960s. It consisted of urad dal and wheat flour mixed together kachori and aaloo (with skin intact) and pumpkin curry flavoured with masala and saunf. It was accompanied with mango sweet and sour pickle and water in a kullarh. Beat That! Agreed, I was about 10 years old during the 60s and I went to Smith Nursery and Day School at Sigra and we had Kachoris and aalo sabzi at Jaljog, served on dried leaves, mud kullarhr for water and you paid on your way out. Never forget that. They also made great Rasogollas. The Jaljog does not exist any more, as I noticed during my last recent visit. Even the Rambhandar seems to be dying away. I was 10 years old during the sixtees and went to Smiths Nursery and Day School at Sigra Chowmani. A trip to Jaljog to enjoy their Kachori (served on dried leaf plate) with potato curry was a must during holidays. Their Rasogollas were very famous too. During my last visit after 35 years, I did not find the old Jaljog. Even the Rambhandar was dying out. Fancy sweet shops have taken over, I guess! That 'Jaljog'of sixties is still unbeatable , even the present day Jaljog is a failure as some people swear by. I tasted Jaljog samosas n kachori in the early nineties and it was not at all impressive. In Banaras , the kachori subzi served in average stalls is still something i would die for ... one such stall at sigra chauraha is my favorite. Banarasi Kachori and allo ki sabzi a perfect combo :)...too tempting!! Your recipes are just amazing. Very authentic and bring back good, old memories. Can you please share the recipe of a dish that is served in banaras ki galiyan for breakfast. It has kala chana, tamatar,aaloo, and baigan with some spices such as panchphoran etc.? It is served with hing ki kachori. Thanks. Yes, I have subscribed to your post. Thanks for the reply. Tried your recipe today. Turned out delicious, thanks for sharing!